LinkedIn is a powerful place to promote your content and present your expertise. 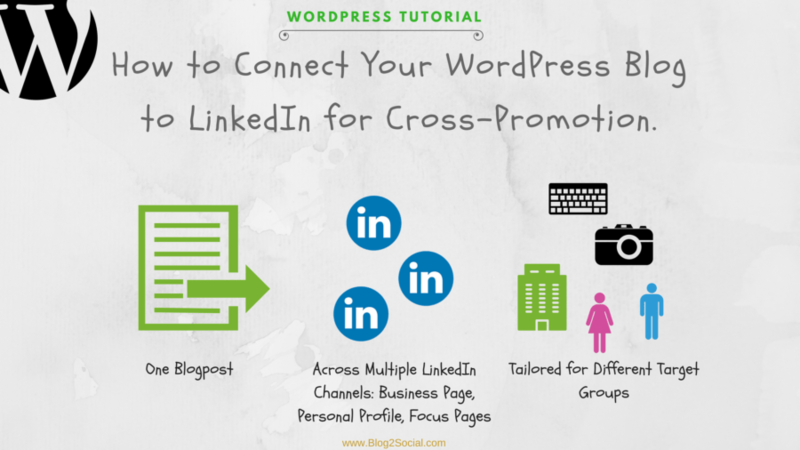 Cross-promotion of your blog posts on various LinkedIn channels is one of the easiest and most efficient ways to do so. 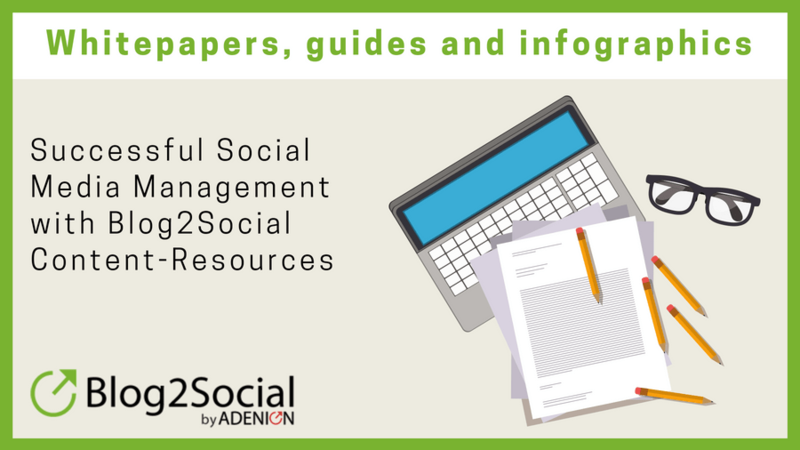 And Blog2Social can help you to promote your content much easier and more efficiently. LinkedIn is an all-in-one presentation platform for your company and yourself: it is business network, lead generator, showcase service and career network. Therefore, LinkedIn offers various channels to present and promote yourself and your content. You can post business information, news and blog posts on your personal profile, your business page as well as on focus pages for specific topics, projects, products and brands. 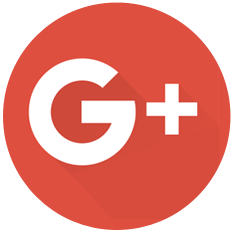 However, sharing your posts manually on the respective, suitable channels is a time-consuming task. You could simply share the same post on your profile as well as your company and focus pages and be done with it. But each of these channels has different requirements regarding the form of address, timing of your blog posts and format. Whether you are networking or job hunting, profiles are an excellent way to make sure that you can be found by the right people at the right time. A Company page on the other hand, helps to build brand awareness, shows prospects your job openings and demonstrates customers your company. If you have employers, you can further include them in your overall business presentation. Focus pages allow you to promote specific products, topics and markets to a specific audience. 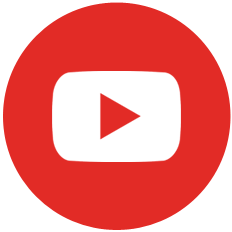 As you can see, each channel has a different target group and therefore different requirements regarding the format and addressing of your audience. Focus pages for example, have a larger header image than other LinkedIn channels, a two-column layout and no career, product or job tabs. Simply put, your showcase pages are more focused on content. Your shared blog posts should be accordingly more detailed and best published during the network’s rush hour: Tuesday – Thursday between 8am and 10am as well as 4pm and 6pm. Company pages, on the other hand, offer you a limited space of 2.000 characters to present your company and your business. Besides, you can share regular status updates on your corporation. Since this is your company’s promotion and information platform, your wording and address should reflect that. Publish your status updates during the network’s rush hour, but at a slightly different time than your shared blog posts on your profile or focus pages. 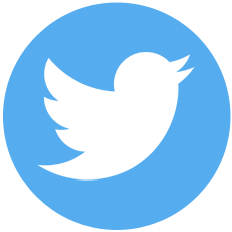 Everytime you publish a post, your post will only be seen by a fraction of your followers. 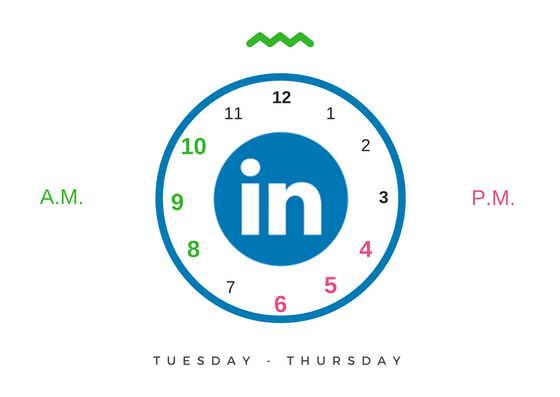 If you cross-promote your post on multiple LinkedIn channels, post it at different times or even days to reach more followers, who missed your original post. However, post within the network’s peak hours to ensure more visibility and engagement. Whereas you might repeat your post on your personal timeline, post to your business and focus pages only once. You may re-post your evergreen content every 2-3 month to revive it. You see, smart cross-promotion means to keep into account quite a lot of aspects. If you want a maximum of engagement, outreach and visibility, it is crucial to individually promote your content across multiple LinkedIn channels. But this does not necessarily involve too much of your time. 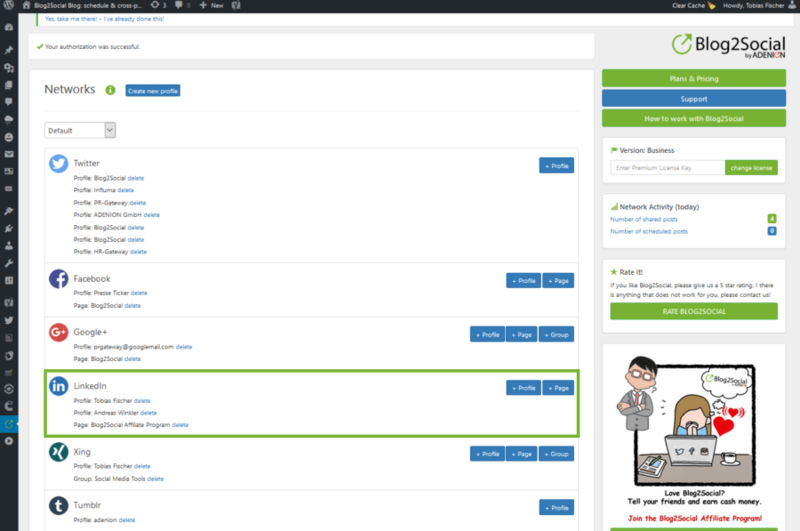 The WordPress plugin Blog2Social allows you to simply connect your blog to LinkedIn and publish your content across more than 15 different channels – simultaneously, with the auto-posting and cross-posting power of Blog2Social. There are a lot of auto-posting tools and plugins out there. But, simply auto-posting your content on all of your channels might not encourage much engagement from your audience. That’s why Blog2Social offers you a “custom sharing & scheduling” option with a variety of customization features to give you full control of your social media management. Publishing your valuable content tailored for each network and community is crucial for the success of cross promotion. Therefore, it is important to have full control on how, when and on where to cross-promote your blog post. With the One-Step-Workflow you have everything under your control. You can simply select or deselect the connected networks and determine a specific publishing scheme. Particularly helpful, if you have a blog post or planned but not yet published content on a special occasion but not the time to publish it on the respective date. You can decide to publish your content the moment you hit share or define a one-time or a recurring scheduling plan. One of the biggest objections towards social media automation tools is the robotic look and feel of the postings most automation tool produce. If you want to engage with your followers, this is a no go. 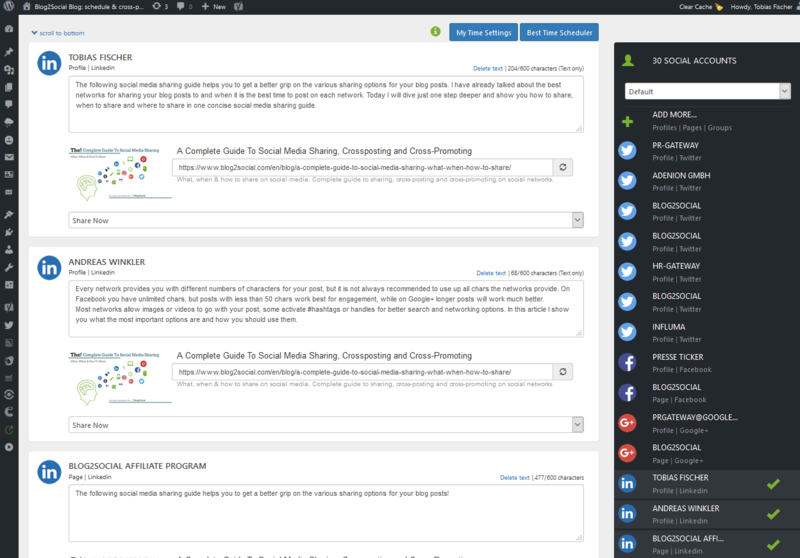 Blog2Social allows you to easily customize each of your blog posts in detail – whereby your postings will sound exactly as you want them to: personal and engaging. That offers you a variety of options, especially, if you want to share the same blog content on multiple LinkedIn channels but with individual salutations and texts for each post. This way, you ensure the right address for different target groups and thematic discussions and you can further optimize your automated social media marketing. Just because it’s an old blog post does not mean it is outdated, right? Exact. You will certainly have evergreen content on your blog, that will keep its topical value, even for years. 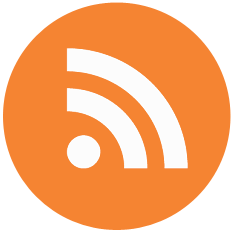 The re-publishing of older blog posts related to a recent discussion can be a great way to show your long-term expertise in a certain field. Therefore, up-cycling older content can be a real asset for your cross-promotion on LinkedIn. 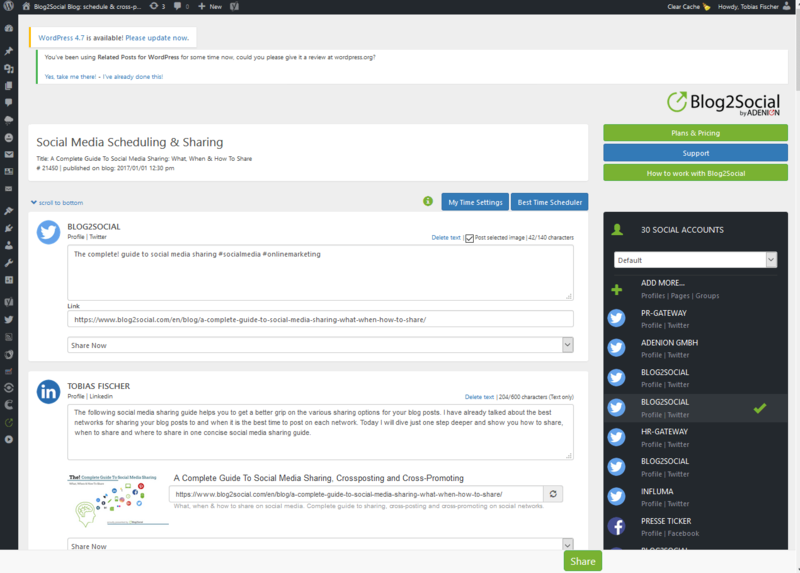 Blog2Social allows you to re-share your old, but still valuable blog posts. 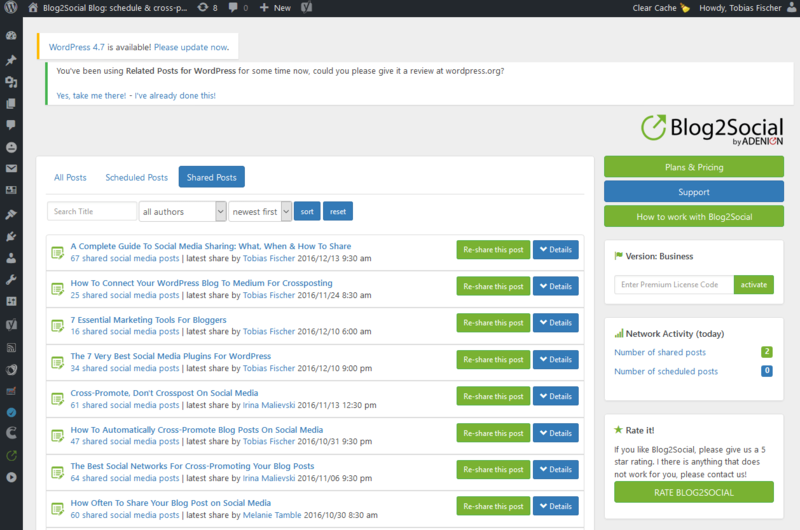 You can either do so directly in your WordPress edit mode or go straight to your Blog2Social dashboard. There you choose “All posts” and click on “Re-share this post”. Now, you can select the profiles you wish to re-publish your content to. And again, you may customize and schedule your posts for the best times of each target audience. As I mentioned before, Blog2Social grants you full control on your automated social media marketing on LinkedIn and other networks – including a detailed reporting function. Re-sharing and recurrently sharing content needs a smart strategy. You may share on your LinkedIn profiles status updates more often than on your page or focus pages or in groups. To avoid too many repetitive postings and therefore a negative perception on your cross-promotion endeavors, Blog2Social offers a detailed reporting feature and the option to bundle profiles, pages and groups for different sharing purposes. 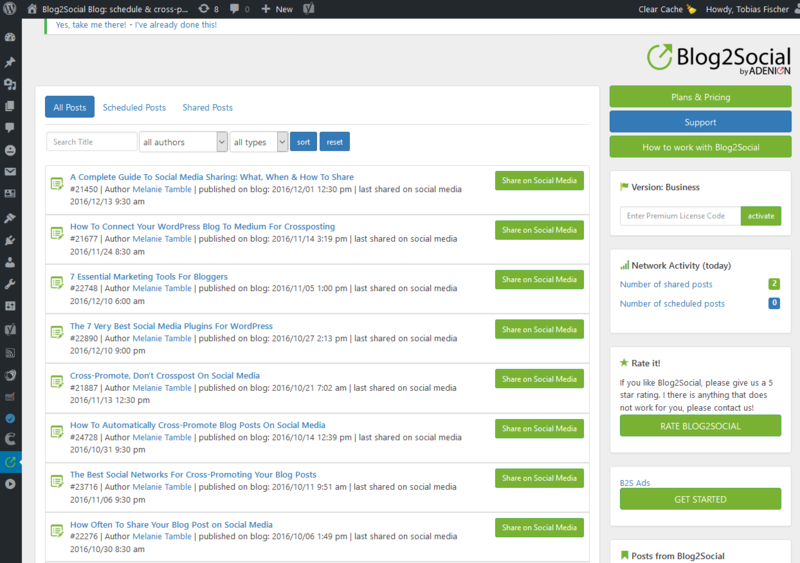 This way you can easily handle your re-sharing tasks and keep track of all your published and shared blog content, including the respective links to your social media postings. LinkedIn is one of the most powerful platforms for cross-promotion. The more value your blog content provides and the more you contribute to discussions, the more likely will other users perceive you the way you want them to. 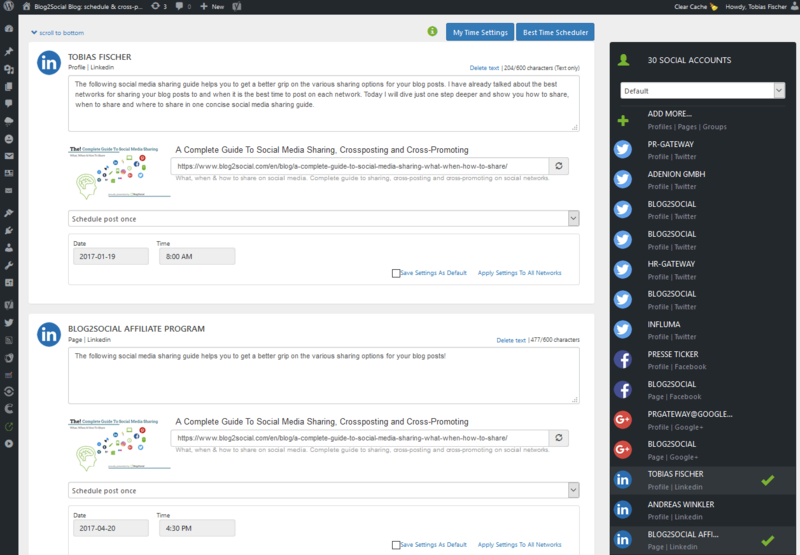 Blog2Social empowers you to use this potential and let you integrate up to 15 different channels. Besides LinkedIn, also consider other networks provided in the plugin to increase cross-promotion to a maximum outcome in front of an engaged, relevant and interested audience.